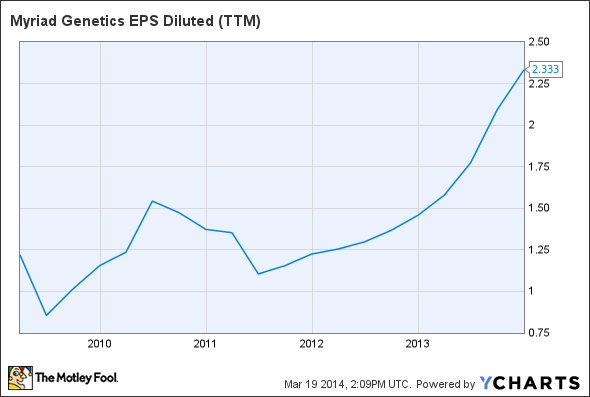 Shorts Piling on to Myriad Genetics: Time to Panic? Myriad's (MYGN) investors may want to reconsider doubts stemming from the company losing its monopoly on tests for BRCA gene mutations. It may be an understatement to say that it's been an important year for Myriad Genetics (NASDAQ:MYGN)A court order essentially invalidated patent protection for its best selling BRACAnalysis test last summer. That test, which identifies mutations to the BRCA 1 and BRCA 2 gene associated with breast and ovarian cancer, accounted for $141 million of Myriad's $204 million in sales last quarter. Investor worries that competitors like Quest Diagnostics (NYSE:DGX) will cut into those sales has led short sellers to build a position equivalent to 54% of the company's shares available for trading. However, those fears may prove overblown given Myriad's sales climbed 37% from last year during the December quarter. That may suggest that BRCA competitors won't be able to cut significantly into Myriad's market share before Myriad transitions customers to new products. Private and public payers are increasingly considering the cost-saving benefit of holistic care rather than transaction based care. That means payers aren't just looking at today's office visit, but are becoming more open to personalized care designed to more accurately diagnose and treat patients earlier. Myriad is at the forefront of the targeted care trend. By identifying genetic mutations associated with disease like cancer, and measuring the gene's impact on protein production, Myriad can provide payers, doctors, and patients with a clearer picture of their current and future health risks. That clarity may help identify disease more quickly, when it's easier to treat, and provide insight into which therapies patients are most likely to respond to. BioMarin (NASDAQ:BMRN) and AstraZeneca (NYSE:AZN) are among those companies with late stage drugs in trials that specifically target genetic mutations. Both BioMarin's BMN-673, which is in phase 3 trials, and Astra's Olaparib, which may get the EU's go-ahead in ovarian cancer this year, address a mutation of the BRCA 1 and BRCA 2 gene that is often associated with breast and ovarian cancer. If successful, those drugs offer an opportunity to significantly expand the market for BRCA testing in the near term, and to increase the broader use of cancer screening in the future. If so, Myriad is perfectly positioned given its BRACAnalysis test is being used in both ongoing trials. The industry growth is attracting interest from competitors like Quest -- one of the largest players in diagnostics. Investors fear Quest, and others, will reduce Myriad's volume and force a margin busting price war shouldn't be dismissed, but may underestimate the Myriad's ability to migrate customers to comprehensive tests, based on more robust data. Such a shift away from Myriad's specialized BRACAnalysis to next generation products may result in a faster adoption of cancer testing that could boost Myriad's utilization and profit. Myriad is already seeing that dynamic play out with the limited release of myRisk, a cancer screening solution that analyzes 25 genes related to a variety of cancer. Myriad rolled out myRisk to a select group of doctors last quarter, and reported in its earnings conference call that volume grew as doctors were no longer faced with prioritizing test targets. That led to myRisk generating more than $11 million in sales last quarter, not bad for a product in a limited release. Myriad thinks it can convert the vast majority of its BRACAnalysis customers to myRisk by the summer of 2015. If so, Myriad may dodge competitive threats to BRCA testing. Myriad breaks out its sales by both product and the type of prescribing doctor. That gives investors insight into whether Quest is winning away business. So far, competitor impact appears limited given BRACAnalysis sales grew 28% from last year to $141 million last quarter. 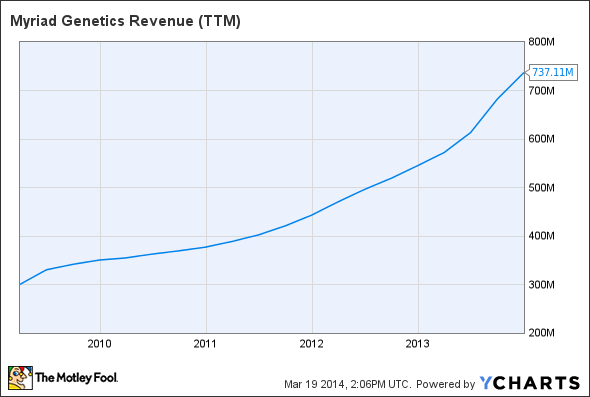 That growth came even though Myriad's addressable market remains under-penetrated. Myriad is working with less than 10% of OB/GYNs, and sales to OB/GYNs climbed 90% to $94 million last quarter. Combined with a 12% lift in oncology sales to $101 million, total revenue grew 37%, marking the company's 10th consecutive quarter with greater than 20% revenue growth. Thanks to volume being leveraged against fixed costs, net income grew 44% from last year to $50 million in the quarter, resulting in earnings per share jumping 57% to $0.66. And there's plenty to like on the valuation side too. Myriad remains debt free, and even after paying out $245 million in cash to acquire autoimmune disease testing company Crescendo, Myriad will still have $244 million in cash on the balance sheet. Myriad is guiding for fiscal 2014 sales of between $740 million and $750 million, up 21% to 22% from fiscal 2013, and EPS of $2.09 to $2.12, up 18% to 20% from a year ago. That means Myriad's shares are trading at under 18 times estimated earnings. Myriad's 1.13 P/E to growth ratio is also intriguing given Quest's PEG ratio is 1.5. Quest is a deeply entrenched leader in diagnostics and its BRCA competitor only launched last fall, so it may be too early to say it won't impact Myriad. During its quarterly earnings conference call, Myriad did report it's seeing some market share loss in the genetics portion of its BRACAnalysis client base, so Quest could be making a dent there. However, that portion of its business makes up just 15% of Myriad's sales and as more customers transition from BRACAnalysis to myRisk, the risk to revenue should fall -- at least for now. That would be good news for investors, particularly if Astra's Olaparib is able to win over regulators, and BioMarin's BMN-673 is able to post similarly strong response rates in late stage studies.